Beaten Rice With Jaggery And Coconut / Aval Nanachathu | Simple and Delicious ! 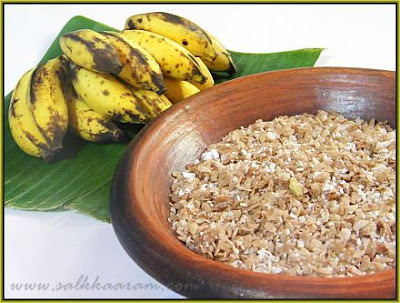 Aval nanachathu is a famous snack / break fast item from Kerala. 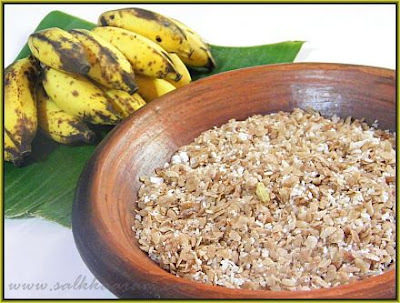 You can take it along with tea, with or without adding freshly grated coconut, sugar or jaggery or with ripe plantains. Sprinkle milk, mix with all the other ingredients. You can chop plantains into thin pieces and add to this. oh its awesome. This flavor gives awesome taste. aval nanachathu is my favorite dish. my mother used to make this for me in my chilhood. itz a tasty snak. couple of weeks back my sister geetha made dis for me while i was at cheruvathany. here in hindu temples this is offering to LORDS ganapathy and hanumaan. It very much is satisfying to me and the dish looks healthy and nutritious.